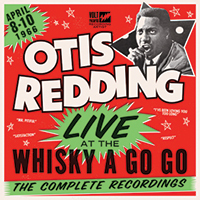 “Are you ready for star time?” That’s the introduction by emcee Al “Brisco” Clark to the six-CD boxed-set of Otis Redding performances at the Whisky A Go Go club. His three-night residency in April 1966 was material for a single album that was designed to capture the power of Redding’s live stage act. The band consists of drummer Elbert Woodson, bassist Ralph Stewart, guitarist James Young, and a serious horn section. Displaying the kind of musical telepathy that comes from seasoned pros, Young provides ample skank, flavor, and hypnotic arpeggiation. Produced by Bill Bentley, the box includes liner notes by Lynell George, who won a Grammy for this project. Popular songs here like “Respect,” “I’ve Been Loving You Too Long,” and “Mr. Pitiful” are riveting, but it’s the raw intensity of the 26-year-old’s complete sets that captivate.